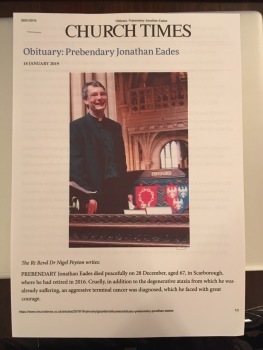 Half muffled in memory of Prebendary Jonathan Eades. During 39 years of ministry he was Dundee University Chaplain, Rural Dean of Leek, Vicar of Wolstanton, Rector of Ashley and appointed Prebendary of Lichfield Cathedral in 2008. His family home is The Old Hall in Mavesyn Ridware, next door to the church, and he was a great supporter of the Millennium Project to augment this ring of bells to the full octave. This composition was composed in 1977 and is now rung for the first time. First peal after the addition of a plate; 4 & 5. Last updated Saturday, 26 January 2019 at 19:00:18. First submitted Saturday, 26 January 2019 at 17:53:12 by Andrew C Ogden. Sent for publication in The Ringing World on Saturday, 26 January 2019 at 17:54:24, and printed in issue 5624, page 135.